To ensure that interested parties have access to both sides of the story, we have also included the report from Loro Parque regarding Morgan being held at their entertainment park. 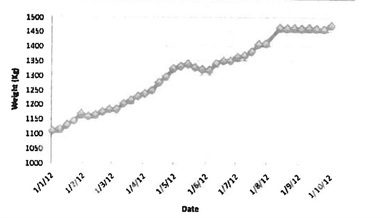 Almunia (2012) has a graph of Morgan’s weight in his report. We are very worried about her, because her weight should not plateau off like this (you can see that shortly after the 1st of August 2012, her weight stops increasing). Photos taken by Dr Visser, in October show distinctive signs that Morgan’s weight is an issue.